eeyuNNi mAdhava perumAL is a dear sishya of nampiLLai. He was also known as siriyAzhwAn appiLLai. It was through him, eedu mahA vyAkyAnam of thiruvAimozhi got ultimately transmitted to maNavALa mAmunigaL. “eethal” means charity in thamizh. “uNNuthal” is eating. eeyuNNi means one who is very charitable that he will only eat after feeding other srIvaishNavas. nampiLLai was engaged in constant delivery of bhagavadh vishaya kAlakshEpams. That was the golden period of srIvaishNavam in srIrangam where everyone was fully getting drenched in bhagavadh anubhavam through the supreme intellect of nampiLLai. By the divine grace of emperumAn and his AchAryan (nanjIyar), nampiLLai was a classy intellectual who was able to expertly explain the beautiful principles that are seen in AzhwArs pAsurams through examples from srI rAmAyaNam mainly and many other purANa/ithihAsa incidents. vadakku thiruvIdhi piLLai was a dear sishya of nampiLLai. While hearing thiruvAimozhi kAlakhsEpams from nampiLLai during the day time, he was recording them in the night regularly. After completing the lecture series once, nampiLLai visits vadakku thiruvIdhi piLLai‘s home once. He notices the palm leaves containing the words which are uttered by him during his thiruvAimozhi kAlakshEpams. He reads them fully and was greatly pleased with the manner in which everything was recorded to perfection. Still, he was upset that vadakku thiruvIdhi piLLai wrote this without his permission. He shows his dissent but eventually gets convinced by vadakku thiruvIdhi piLLai’s great dedication. This vyAkyAnam of thiruvAimozhi becomes to be famously known as eedu 36000 padi. He hands over the palm leaves to eeyuNNi mAdhava perumAL and asks him to teach the same to his descendants. This charithram is explained in https://guruparamparai.wordpress.com/2012/09/17/vadakku-thiruveedhi-pillai/. eeyuNNi mAdhava perumAL teaches this to his son eeyuNNi padhmanAbha perumAL. 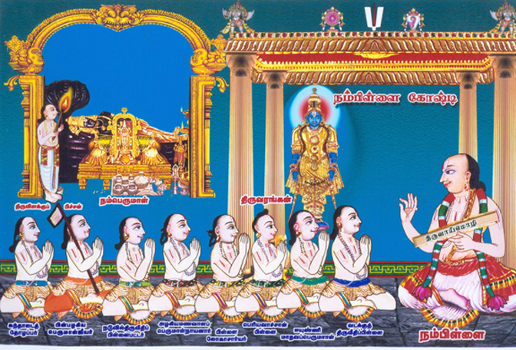 eyuNNi padhmanAbha perumAL’s thirunakshathram is svAthi. eeyuNNi padhmanAbha perumAL teaches this to his dear sishya nAlur piLLai. nAlur piLLai is a descendant of nAlurAn (sishya of kUrathAzhwAn). He was born in mElpAdagam (thoNdai nAdu). His thirunakshathram is pUsam (pushyam). He is also known as sumana:kOsElar, kOla varAha perumAL nAyanAr, rAmAnujArya dhAsar, aruLALar thiruvadi UnRiyavar. His sishyas include nAlUrAchAn piLLai, thiruppuLingudi jIyar and thirukkaNNangudi jIyar. thiruppuLingudi jIyar has written a grantham named srIvaishNava charitham. nAlUrAchAn piLLai is the son and dear sishya of nAlUr piLLai. His thirunakshathram is mArgazhi bharaNi. He is also known as dhEvarAjAchAn piLLai, dhEvEsar, dhEvAdhipar and mElnAdu AchAn piLLai. nAlUrAchAn piLLai learns eedu 36000 padi under the lotus feet of his father. His sishyas include thirunArAyaNapurathu Ay, iLampiLichaipiLLai and thiruvAimozhi piLLai. Both nAlUr piLLai and nAlUrAchAn piLLai were living in thirunArAyaNapuram. thiruvAimozhi piLLai travels to kAnchIpuram to learn the meanings of thiruvAimozhi under the orders of kUra kulOthuma dhAsar. At the same time, nAlUr piLLai and nAlUrAchAn piLLai also arrive at kAnchipuram. They all meet in front of dhEva perumAL. dhEva perumAL speaks through the archakar at that time, reveals that piLLai lOkAchAryar is none other than emperumAn himself and orders nAlUr piLLai to teach eedu vyAkyAnam to thiruvAimozhi piLLai. But nAlUr piLLai asks dhEva perumAL if he can teach him effectively (due to his old age). dhEva perumAL then says “Your son (nAlUrAchAn piLLai) can teach him then. If he teaches its as good as you yourself teaching him”. Thus thiruvAimozhi piLLai along with others learns eedu vyAkyAnam under nAlUrAchAn piLLai and eventually he returns to AzhwAr thirunagari and teaches the same to maNavALa mAmunigaL who becomes to be famously known as eettu perukkar (one who nourishes eedu vyakyAnam). nAlUr piLLai or nAlUrAchAn piLLai is said to have written vyAkyAnams for thirumozhi and periyAzhwAr thirumozhi. mAmunigaL, in his upadhEsa rathina mAlai, explains the transmission of eedu vyAkyAnam beautifully in pAsurams 48 and 49. In the 48th pAsuram, he says vadakku thiruvIdhi piLLai documented eedu 36000 padi vyAkyAnam and nampiLLai took that away from him and handed it over to eeyuNNi mAdhava perumAL. In the 49th pAsuram, he says from eeyuNNi mAdhava perumAL, his son eeyuNNi padhmanAbha perumAL learns it and subsequently its transmitted to nAlUr piLLai and nAlUrAchAn piLLai. Subsequently it is then taught to thiruvAimozhi piLLai, thirunArAyaNapurathu Ay, etc. Thus, we have seen some glimpses of the glorious life of eeyNNi mAdhava perumAL. He was a great scholar and was very dear to nampiLLai. Let us pray at his lotus feet that we too get a little bit of such bhAgavatha nishtai. We have also seen how eedu was transmitted from nampiLLai to maNavALa mAmunigaL in this article. This entry was posted in other AchAryas on April 21, 2013 by sarathyt. mika mika ARPUTHAM, guruparamparai mikavum puriym padi paguntharkku DANYOTHSMI. thanks for the feedback swamy. yes, at some point we will consider printing them as books. nowadays, most people have internet facility where these can be downloaded until we have them in book format. but agreed that to reach local masses, we need to print these as books and distribute them.